New Mystery Dungeon game?! Or an untrue rumor? I heard a new PKMN Mystery Dungeon game is coming out, where the two main Pokémon want to create a paradise. Is this true?! I love Pokémon Mystery Dungeon! Yes it's true,and it's called "Pokemon Mystery Dungeon-Magnagate&The Infinity Labyrinth". It is to be released on November 23rd 2012 in Japan. Ahh! How suckish! Wish i had a 3ds..
Will it be in English? 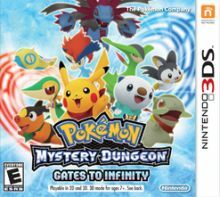 Can you evolve you main Pokemon inside the story of the new Mystery Dungeon game: Magna Gate and The Infinite Labyrinth? Does the new Mystery Dungeon game have a plot beyond just exploring stuff? What is the best pair of starters in the new Pokemon mystery dungeon gates to infinity? Does Pokemon Mystery Dungeon: Gates to Infinity have any story related post game? What is wrong with my Mystery Dungeon game?